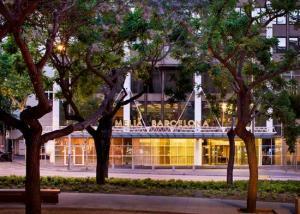 The Hotel Meliá Barcelona Sarriá is a hotel in the centre of Barcelona, only 15 minutes from the famous Paseo de Gracia boulevard. Totally refurbished, the hotel enjoys a magnificent location near the Avenida Diagonal and a couple of minutes from the tourist bus stop. Only a 15 minute walk from the Paseo de Gracia or the FC Barcelona Nou Camp football stadium. The hotel provides all guests with free Wi-Fi Internet.All of the rooms are very spacious and with all of the services and facilities expected of a luxury hotel in Barcelona. They provide a 32 inch TV, a DreaMax mattress specially designed for Meliá hotels, and the majority also have a hydromassage bathtub.We particularly recommend our rooms on The Level , superior category rooms which also allow access to a private lounge and breakfast area with a free snack service throughout the day, amongst other benefits.The urban YHI Wellness – spa of this hotel in Barcelona provides an indoor swimming pool, saunas, beauty treatments and massages. There is also a free gymnasium open 24 hours a day for hotel guests.The Hotel Meliá Barcelona Sarriá also boasts extensive dining options, either the Mediterranean cuisine with a modern touch in the UNO restaurant or the Bar Q-Lounge for cocktails and tapas while you watch a match or relax and chat.